Normal or medium arches are the most common. If you can see about half of your arch, your feet are considered to be of normal pronation. This pronation accurately absorbs shock and provides your body with correct support. A flat foot, on the other hand, reveals almost the entire footprint. Flat feet are associated with overpronation (your feet roll too far inward with impact) which results in excessive foot motion and an increasing risk of injury. Everyone is born with flat feet, but for some, the arch never develops. Children may not complain that their feet hurt, but that they just get tired. Other reasons your feet may be flat include injury, and normal wear and tear of the tendons that run along the foot. If you've experienced trauma to the foot, you may experience a swollen ankle and pain in the heel and arch area. Other symptoms include fatigue of the feet and pain while standing or walking. Factors that may increase your risk for developing collapsed arches include: obesity, traumatic injury to the foot or ankle, rheumatoid arthritis, and the aging process. Flat feet are often misaligned, which can cause knee and back pain for a lifetime. Many parents are told that their children will outgrow their flat feet, and adults are often told to simply wear arch supports; meanwhile, misaligned feet continue to cause pain and problems. 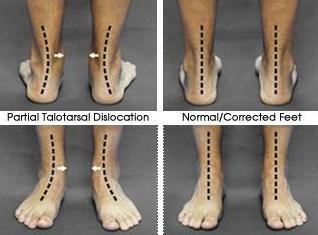 If your feet are misaligned—also known as talotarsal displacement or dislocation—you may notice that your ankles appear to rotate inward while your feet rotate out. This can lead to intense pain in your knees, hips, and back as your weight is improperly distributed with every step. You don't have to avoid the activities you love because of foot pain. If you're experiencing discomfort, there are treatment options at your disposal. Symptoms of flat arches can be combatted with arch supports and custom orthotics, or other supportive devices, however they do not correct the problem. In order to fully treat the foot, the structure must change. Dr. Darren Silvester understands that many patients don't respond well to arch supports and orthotics. He has treated a number of children and adults successfully by exploring a more permanent solution. Next Step Foot & Ankle Clinic is a Center of Excellence for the mininally invasive surgery known as HyProCure, The procedure realigns your ankle with your heel bones with a small titanium stent. In just a few weeks, patients can walk normally, and tendons, ligaments and bones adapt to your corrected ankle position. Click here to learn more about HyProCure. The procedure can be performed at Olympia Surgery Center. Do I need surgery for flat feet? Why do the surgery at all for flat feet? What is the best age to consider surgery for flat feet? What type of surgeries are there for flat feet? How do you get flat feet as a child? What is the problem with flat feet? Are flat feet in kids normal? I feel so much better now! I would recommend surgery to anyone with flat feet! And now he competes in cross country running, soccer, and football with no complaints of aches or pains. If your feet are causing you pain and the wet test has proven that you have flat feet, we can help! Our office can provide you with stretching exercises to strengthen the Achilles tendon, suggest proper footwear, and discuss whether surgery is right for you. Contact Dr. Darren Silvester at Next Step Foot and Ankle Clinic in Pleasanton, TX, to begin your road to recovery. Make your appointment today by calling our office at (830) 569-3338 or peruse our website for more information. You can also make an appointment with us online. Give your feet the attention they deserve.